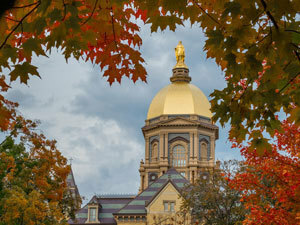 Convened in spring 2015 by Notre Dame Executive Vice President John Affleck-Graves, the committee was composed of faculty, staff and undergraduate and graduate students and charged with reviewing the University’s current sustainability practices and providing a long-term plan consistent with its Catholic mission. The president outlined four broad areas in which the Notre Dame community can best direct its efforts and resources to become a more sustainable campus. “First, we must as an institution strive to be better at conservation and work to inculcate in our students and every member of the community habits of conservation,” he said. “There is more the University as a whole and each of us can do in this regard. “Second, we will continue to move to more sustainable sources of energy.” To that end, Notre Dame has committed to cease using coal in its power plant by 2020, is installing geothermal wells across campus and developing plans for expanded solar and hydroelectric power. “Thirdly,” Father Jenkins said, “we must continue to educate our students and ourselves about environmental matters and sustainability practices, and develop individual and collective habits that sustain the environment. A standing committee of faculty, staff and students will be appointed to review progress on goals and consider continuing steps. Small working groups also will be appointed to identify benchmarks, tasks and goals within each of the six areas of focus. The committee was convened as part of Notre Dame’s response to Pope Francis’ 2015 encyclical Laudato si’. Originally published by Dennis Brown at news.nd.edu on September 20, 2016.